Immune regulation of autoimmune disease can function at two sites: at the secondary lymphoid organs or in the target organ itself. In this study, we investigated the natural resolution of autoimmune pathology within the CNS using murine experimental autoimmune encephalomyelitis (EAE). 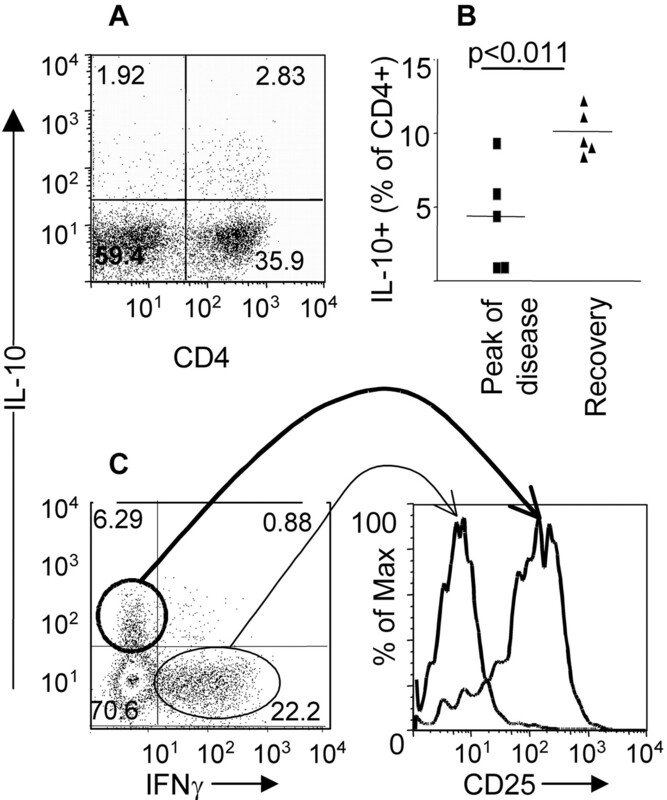 Recovery correlates with the accumulation of IL-10-producing CD4+CD25+ T cells within the CNS. These CD4+CD25+ cells represent as many as one in three of CD4+ cells in the CNS during recovery, they are FoxP3+ and express other markers associated with regulatory cells (CTLA-4, GITR, and αEβ7), and they have regulatory function ex vivo. Depletion of CD25+ cells inhibits the natural recovery from EAE. Also, depletion of CD25+ cells after recovery removes the resistance to reinduction of EAE observed in this model. Furthermore, passive transfer of CNS-derived CD4+CD25+ cells in low numbers provides protection from EAE in recipient mice. These are the first data demonstrating the direct involvement of CD4+CD25+ regulatory T cells in the natural resolution of autoimmune disease within the target organ. Understanding the processes that mediate the natural resolution of autoimmune disease will facilitate the design of optimal therapeutic strategies. During experimental autoimmune encephalomyelitis (EAE),3 myelin-reactive proinflammatory CD4+ T cells infiltrate the CNS and, in concert with other mononuclear cells, cause inflammation and progressive paralysis. In our hands, C57BL/6 mice develop a monophasic disease that peaks ∼14 days after immunization with the immunodominant 35–55 peptide of myelin oligodendrocyte glycoprotein (MOG) (1). A spontaneous recovery follows, making this a very useful model for studying the regulation of pathogenic self-reactive CD4+ T cells in vivo. A number of mechanisms are likely to contribute to this recovery (2, 3, 4). IL-10 has profound regulatory effects on the immune system (5) and is vital for recovery from EAE, because remission is impaired in IL-10−/− mice (6). The levels of IL-10 mRNA increase in the CNS during the recovery phase of EAE (7), and, importantly, exogenous administration of IL-10 is only truly effective at ameliorating EAE when targeted directly to the CNS (8). More recently, we have shown that a requirement for B cells in the recovery from EAE (9) can be narrowed to their production of IL-10 (10). However IL-10 can be produced by a variety of cell types, so B cell-derived IL-10 may be necessary but not sufficient for recovery. To fully understand the recovery from disease in our model, we have therefore performed a kinetic and functional analysis of the cellular composition of the EAE lesion in the CNS. In this study, we report that, although B cells play a role in recovery, they do not appear to migrate into the CNS to significant levels. Instead, IL-10 production in the CNS is concentrated in a CD4+CD25+ population. These cells have the hallmark phenotype of CD4+CD25+ regulatory T cells (Tregs) (11, 12), in that they are CTLA-4high, GITRhigh, and CD44high, and perhaps most importantly they are FoxP3+. CNS CD4+CD25+ cells are suppressive in vitro, confirming their regulatory function. In vivo, depletion of CD4+CD25+ cells before EAE induction leads to a significantly delayed recovery. In addition, postrecovery CD25+ cell depletion abrogates the resistance to reinduction in this model. Finally, transfer of low numbers of CD4+CD25+ cells from the CNS of recovering mice before EAE induction reduces disease severity in recipients. Taken together, these results show that, in addition to B cells, CD4+CD25+ regulatory cells are also involved in recovery from EAE, and their accumulation in the CNS suggests that this is at least partly through action in the effector site. Although a large body of evidence now details the role of Tregs in the prevention of spontaneous autoimmunity, this study provides evidence for the ability of these cells to mediate spontaneous recovery from an active disease process in the target organ. C57BL/6 (Ly5.2+ and Ly5.1+) mice were bred under specific pathogen-free conditions at the University of Edinburgh. The MOG-(35–55) peptide (MEVGWYRSPFSRVVHLYRNGK) was prepared at the Advanced Biotechnology Centre, Imperial College (London, U.K.). Tissue culture medium was RPMI 1640 medium, supplemented with 2 mM l-glutamine, 100 U/ml penicillin, 100 μg/ml streptomycin, and 5 × 10−5 M 2-ME (all from Invitrogen Life Technologies) and FCS as indicated. Each mouse received 100 μg of MOG-(35–55) peptide emulsified in CFA containing 50 μg of heat-killed Mycobacterium tuberculosis H37Ra (Sigma-Aldrich) at a final volume of 100 μl injected s.c. into the hind legs. In addition, 200 ng of pertussis toxin (European Cell and Culture Collection, Dorset, U.K.) was given in 0.5 ml of PBS i.p. on the same day and 2 days later. Clinical signs of EAE were assessed daily with the following scoring system: 0, no signs; 1, flaccid tail; 2, impaired righting reflex and/or gait; 3, partial hindlimb paralysis; 4, total hindlimb paralysis; 5, hindlimb paralysis with partial forelimb paralysis; 6, moribund or dead. Differences in total disease burdens were analyzed using the Mann-Whitney U test. In some experiments, EAE was reinduced by the same immunization protocol as above, using IFA, administered in two sites in the flanks. Mice were sacrificed by CO2 asphyxiation and perfused with cold PBS. Spinal cords were removed by intrathecal hydrostatic pressure. Cords were cut into small pieces and digested with 2.5 mg/ml collagenase (Worthington Biochemical) and 1 mg/ml deoxyribonuclease (Sigma-Aldrich) for 25 min at 37°C followed by mechanical disaggregation. Single cell suspensions were washed once in tissue culture medium containing 30% percoll (Invitrogen Life Technologies). Mononuclear cells were prepared from the interface of a 30:70% discontinuous percoll gradient after centrifugation for 20 min at 2000 × g.
Cells were stained for FACS using the following Abs (all from BD Pharmingen): anti-CD4-allophycocyanin, anti-CD19-FITC, anti-CD11c-allophycocyanin, anti-CD8-PE, anti-Ly5.1-FITC, anti-B220-peridinin chlorophyll-a protein (PcP), anti-CD25-biotin followed by streptavidin-PcP, anti-IL-10-PE, anti-IFN-γ-FITC, anti-CTLA-4-PE, anti-GITR-FITC, anti-CD44-PE, anti-CD69-biotin followed by streptavidin-PcP, anti-αEβ7-FITC, and relevant isotype controls as indicated in figure legends. Anti-FoxP3-FITC and isotype control (rat IgG2a-FITC) and staining kit were purchased from eBioscience and used according to the manufacturer’s instructions. All FACS staining was done in the presence of anti-mouse FcR (24G2). FACS data were collected on a FACSCalibur machine (BD Biosciences), and data were analyzed using FlowJo software (Tree Star). For intracellular cytokine staining, cells were stimulated for 4 h at 37°C with 50 ng/ml PMA and 1 μg/ml ionomycin (both Sigma-Aldrich) with 1 μl/ml Golgistop (BD Pharmingen). Cells were stained for expression of surface markers and then fixed, permeabilized, and stained using the Cytofix/cytoperm kit (BD Pharmingen) according to the manufacturer’s instructions. Intracellular CTLA-4 staining was performed on cells that had been fixed and permeabilized as for cytokine staining. For in vivo CD25+ cell depletion experiments, 1 mg of PC61 or isotype control Ab (rat IgG1, MAC49 from ECACC) was given i.p. in 0.5 ml of PBS. Depletion was confirmed by flow cytometric analysis of the percentage of CD4+CD25+ cells in peripheral blood samples from mice, using an Ab that recognizes a distinct epitope of CD25 (7D4), and was consistently greater than 90% 3 days after PC61 administration. B cells and CD4+ cells were purified from single cell spleen suspensions by first positively selecting CD4+ cells with CD4-microbeads (Miltenyi Biotec) and then negatively selecting B cells with CD43-microbeads (Miltenyi Biotec), both according to manufacturer’s instructions. Purity of cells obtained was greater than 90%, as assessed by FACS. For transfer, cells were resuspended in PBS, filtered to remove clumps, and injected i.v. in the tail vein. For lymph node (LN), single cell suspensions were enriched for CD4+ cells by incubating with the following mixture of Abs, all rat IgG: anti-CD8 (clone 53-6.72), anti-B220 (clone RAB632), anti-Mac1 (M1/70), anti-MHC class II (M5/114.15.2) each at 10 μg/ml in HBSS (Sigma-Aldrich) supplemented with 100 U/ml penicillin and 100 μg/ml streptomycin (Invitrogen Life Technologies) and 2% FCS (Sigma-Aldrich); followed by incubation with sheep anti-rat IgG M450 Dynabeads (Dynal Biotech). Cells not bound to the magnetic beads were collected. Purity of CD4+ cells was routinely above 70%. CD4-enriched LN cells, or whole mononuclear CNS cells, were labeled with anti-CD25-PE (Miltenyi Biotec) and anti-CD4-allophycocyanin (BD Pharmingen) before sorting on MoFlo (DakoCytomation) (see Fig. 6⇓) or anti-CD25PE and anti-CD4-FITC (BD Pharmingen) before sorting on a FACStar cytometer (BD Biosciences). Purity of CD4+CD25+ cells was routinely above 98% for LN cells and above 85% for CNS cells. Triplicate cultures of 2 × 104 CD4+CD25− cells, 1 × 105 irradiated (30 Gy) splenic APC, 2.5 μg/ml anti-CD3 (clone 145.2C11), and the indicated number of CD4+CD25+ cells were incubated in tissue culture medium supplemented with 5% FCS (Sigma-Aldrich), for 96 h. [3H]TdR (0.5 μCi; Amersham Biosciences) was added for the final 18 h of culture. For some assays, anti-IL-10 (clone JES5–16E3; BD Pharmingen) or anti-IL-10R (clone 1B1.3; BD Pharmingen) was added at 10 μg/ml as indicated. We have previously shown that production of IL-10 by B cells is vital for recovery from EAE (10), using bone marrow chimeras in which IL-10 deficiency was restricted to B cells. B cells might influence EAE through actions in the lymphoid organs or directly in the CNS. Kinetic analysis revealed that B cells did not accumulate in the CNS to any significant degree during the course of EAE (Fig. 1⇓, A and B). In our previous study, transfer of B cells from the spleens of wild-type mice that had recovered from EAE (day 30) could restore recovery in chimeric mice, and in fact these mice developed EAE of milder severity than mice that had not received B cells (10). We have confirmed that post-EAE B cells also have a protective effect when transferred into wild-type B6 mice (Fig. 1⇓C). Transfer of Ly5.1 disparate B cells again indicated that this protective effect did not correlate with B cell accumulation in the CNS (Fig. 1⇓D). 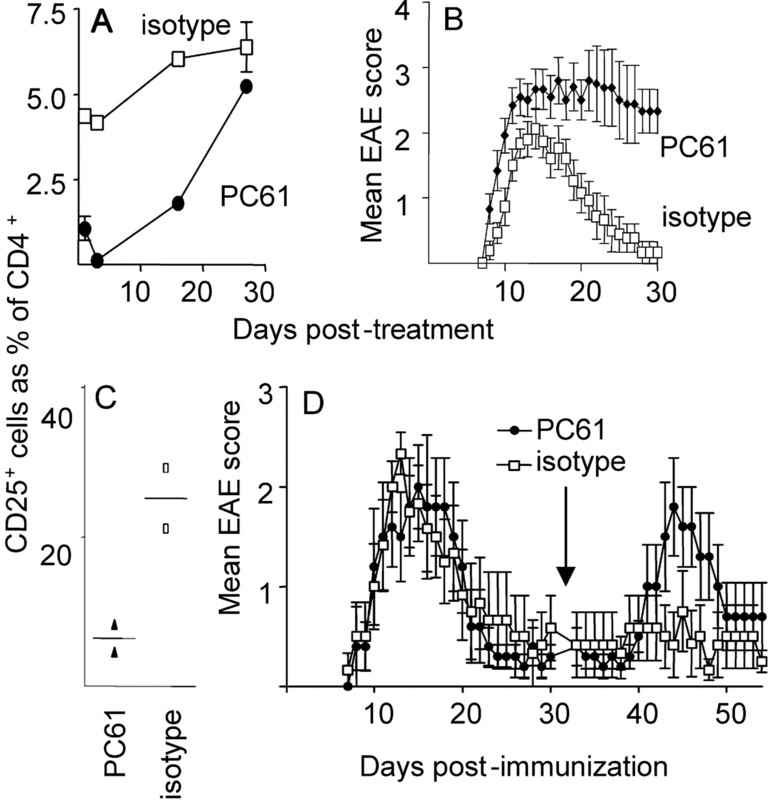 In contrast, CD4+ T cells isolated from spleens after recovery did not protect recipient mice from EAE induction and in fact enhanced disease severity in some mice (Fig. 1⇓E). This correlated with a high proportion of Ly5.1+CD4+ cells in the CNS at the peak of disease (Fig. 1⇓F), and many of these cells produced IFN-γ after ex vivo stimulation with PMA and ionomycin (data not shown). 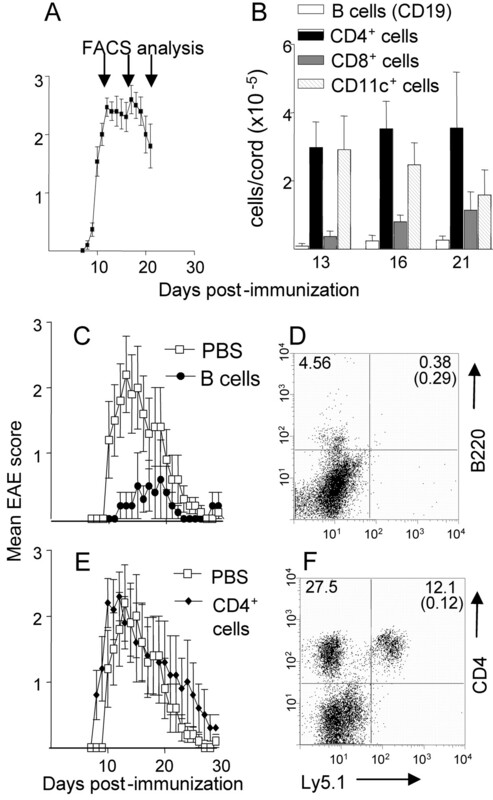 B cells do not accumulate in the CNS during recovery or protection from EAE. A and B, EAE was induced, and the number of different cell types in the spinal cord of individual mice (five per group) was assessed. Mean total number of cells obtained in this experiment were as follows: day 13: 1.73 × 106 ± 4 × 105, day 16: 1.6 × 106 ± 2.7 × 105, day 21: 1.3 × 106 ± 5.9 × 105. C–F, EAE was induced, and 30 days later splenic B cells or CD4+ cells were purified from mice in remission. Naive recipients (five per group) each received 3 × 106 cells 1 day before EAE induction. Consistent data were obtained in three separate experiments. D and F, Ly5.1+ mice in remission were used as donors, and spinal cords of recipients were analyzed 14 days after EAE induction. Spinal cord cells were analyzed for expression of Ly5.1 and B220 (D) or CD4 (F) The percentage of total lymphocytes is shown on the FACS plot, and numbers in parentheses show background fluorescence for Ly5.1 on unstained samples collected simultaneously. Each plot represents pooled cells from three mice. Data were consistent in three separate experiments. The above results suggested that the location for B cell IL-10 production during recovery from EAE is within the secondary lymphoid organs rather than the CNS. Because IL-10 is known to increase in the CNS and is likely to be important during recovery from EAE (7), the production of IL-10 by lymphoid cells in the CNS was investigated. CD4+ cells were found to be major producers of IL-10 (Fig. 2⇓A). Although the proportion of CD4+ cells in the CNS producing IL-10 ex vivo was small compared with those producing IFN-γ (2–13% IL-10 producers vs 25–50% IFN-γ producers), there was an overall increase in the proportion of IL-10+ CD4+ cells over time (Fig. 2⇓B) correlating with recovery. It was also interesting to note that the proportion of CD4+ cells able to produce IFN-γ did not appear to decrease as mice recovered (data not shown), indicating that Th1 cells were not simply eliminated during the recovery phase. A proportion of CD4+ cells in the CNS of mice with EAE produce IL-10 ex vivo and express CD25. A, Mononuclear cells from pooled spinal cords of four mice 20 days after EAE induction were stimulated ex vivo with PMA/ionomycin and stained for intracellular IL-10 and expression of CD4. Data are representative of five experiments performed at similar time points. B, Spinal cords were harvested from mice with EAE at the peak of disease (days 13–16 postimmunization) or recovery phase (days 19–28) (three to five mice per point). Mononuclear cells were stimulated with PMA/ionomycin, and intracellular IL-10 was analyzed by flow cytometry. C, Spinal cords were harvested from four mice on day 20 of EAE, and lymphoid cells were stimulated ex vivo with PMA/ionomycin. Expression of cell surface CD25 by cytokine-producing CD4+ cells was analyzed by FACS. Similar results were obtained in five experiments and at different time points during EAE. IL-10 and IFN-γ appeared to be produced essentially by separate CD4+ populations, with relatively few cells being able to produce both (Fig. 2⇑C). This suggested the presence of competing pathogenic and Treg populations. Because CD25 is constitutively expressed by some Treg populations, we examined its expression by the individual cytokine-producing populations in the CNS. There was a clear dichotomy: IL-10+ cells were CD25+, whereas IFN-γ+ cells were CD25− (Fig. 2⇑C). IL-2-producing cells from the CNS were also negative for expression of CD25 (data not shown). Tregs of known Ag specificity have been shown to expand or accumulate in draining lymph nodes after immunization or in response to tissue inflammation (13, 14, 15, 16, 17), as well as at the site of inflammation (18). We found that the proportion of CD4+CD25+ cells in the inguinal LN (draining the site of immunization) and spleen remained fairly constant throughout the disease course (Fig. 3⇓A). However, there was a marked increase in the percentage of CD4+ cells expressing CD25 in the CNS as EAE progressed from day 13 (peak) through to day 20 (recovery) (Fig. 3⇓A). The number of CD4+CD25+ cells also increased with time, although to a lesser extent (Fig. 3⇓B); 20–30% of CNS CD4+CD25+ cells produced IL-10 at all time points after ex vivo stimulation, whereas the proportion of LN CD4+CD25+ cells that produced IL-10 after ex vivo stimulation was low (Fig. 3⇓C). The proportion of CD4+ cells expressing CD25 in CNS increases during recovery, and CNS CD4+CD25+ cells are enriched for IL-10 production. A, Inguinal LN, spleens, and spinal cords were taken at the time points indicated (four mice per day) and pooled for FACS staining. Pooled results are from two experiments in which the percentage of CD4+ cells expressing CD25 during the EAE time course were analyzed; overlaid EAE graph shows disease scores from one of the two experiments. B, Number of CD4+CD25+ and CD4+CD25− cells in the CNS. Data shown are means of five individual mice per time point, representative of two separate experiments. C, IL-10 production by CD4+ cells on day 16 after EAE induction. The proportion of CD25+ cells positive for IL-10 is typical of several time points analyzed. Not shown: isotype control stainings for IL-10 and CD25 were not above background levels. Naturally occurring CD4+CD25+ (Treg) cells are known to constitutively express several T cell activation markers in addition to CD25 (reviewed in Ref.11). The CD4+CD25+ and CD4+CD25− populations in LN and CNS were compared for their expression of GITR, CTLA-4, CD44, CD69, and CD103 (Fig. 4⇓). CD4+CD25+ cells in the CNS displayed a similar phenotypic profile to CD4+CD25+ cells in the LN (of both naive mice and those with EAE). They were GITRhigh, CTLA-4+, and CD44high. In contrast, CD4+CD25− CNS cells expressed GITR and CTLA-4 at low levels, albeit slightly higher than LN CD4+CD25− cells. The majority of CD4+ cells in the CNS were CD44high, confirming the presence of mainly Ag-experienced/activated cells at the site of inflammation. The proportion of both CD25+ and CD25− cells expressing CD69 was also greater in the CNS than in the LN, suggesting recent activation within the CNS; indeed, CD69+ cells appeared to be the major cytokine producers ex vivo (data not shown). CD4+CD25+ cells in CNS are highly activated and resemble naturally occurring Tregs. Spinal cord and inguinal LN cells from four mice on day 20 post-EAE induction as well as LN from three naive mice were pooled and stained for FACS. Plots shown are gated on CD4+ cells, and filled histograms show isotype control staining. Mean fluorescence intensity (GITR, CTLA-4) or percentage of positive/high cells (CD44, CD69, CD103) are shown. Expression of the integrin CD103 (αEβ7) has recently been shown to correlate with a more potent subpopulation of CD4+CD25+ regulatory cells (19, 20) that preferentially migrates to sites of inflammation (19). It was therefore interesting to note that CD4+CD25+ cells in the CNS of mice with EAE were enriched for CD103 expression (Fig. 4⇑). The levels of expression of CTLA-4 and GITR were also higher on CD4+ (both CD25+ and CD25−) cells from the CNS than from LN of either naive mice or those with EAE (Fig. 4⇑), and this was particularly evident when comparing CD25+ cells, again suggesting a high activation status of all CD4+ cells in the CNS. 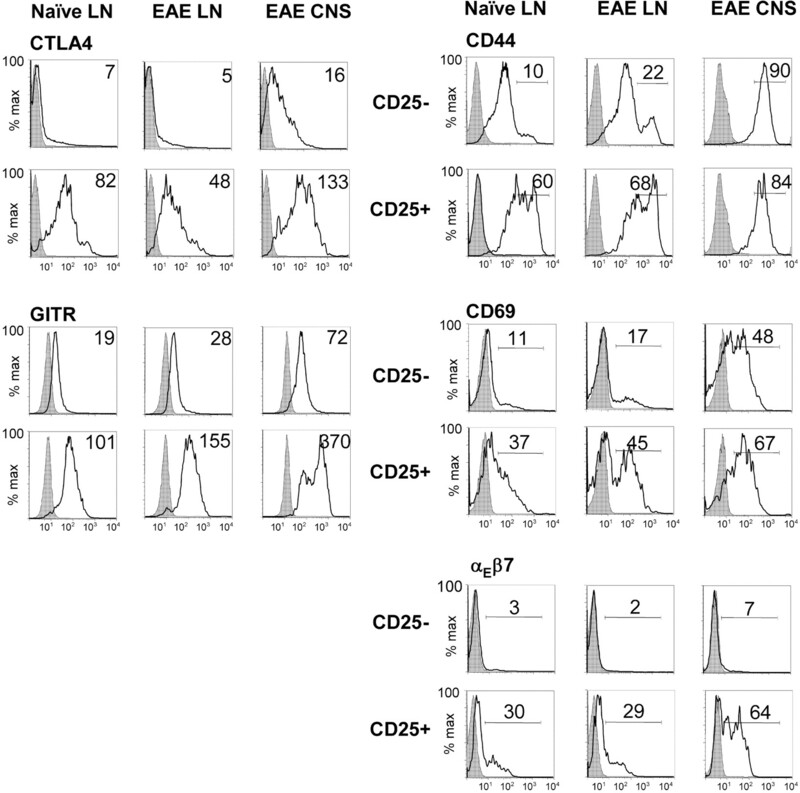 It is interesting to note that cells from the LN of naive mice or mice with EAE were phenotypically similar, apart from a slight increase in the proportion of CD25− cells that were CD44high and CD69high and an increased proportion of CD25+ cells that were CD69high in EAE LN. This indicates activation of only a proportion of cells in the draining LN of immunized mice, whereas the CNS appears highly enriched for activated cells. Although CD25 expression is not a definitive marker for Tregs, the transcription factor FoxP3 does seem to determine differentiation of the regulatory phenotype and distinguish Tregs from activated T cells (21, 22, 23). The expression of FoxP3 in relation to CD25 expression by CNS CD4+ cells was therefore assessed. The majority of CD4+CD25+ cells in the CNS were found to express FoxP3 (Fig. 5⇓A), at all time points analyzed (Fig. 5⇓, B and C), confirming that CD25+ cells are regulatory cells not activated Th2 cells. CNS CD4+CD25+ cells express FoxP3. CNS and inguinal LN cells were analyzed by flow cytometry for expression of FoxP3 and CD25. A, Representative plots from individual mice, gated on CD4+ cells. B, Percentage of CD4+ cells expressing FoxP3 or CD25 (mean of five mice/group) over time in the CNS, overlaid with the EAE disease course. C, Number of CD4+FoxP3+ cells in the CNS over time. Consistent data were obtained in two experiments. A further distinguishing characteristic of Tregs is the ability to suppress the in vitro proliferation of other T cells. CD4+CD25+ cells were sorted by FACS from the LN and CNS of mice with EAE (Fig. 6⇓A) to allow their suppressive potential to be assessed. The CNS-derived cells could suppress the proliferation of naive responder (CD4+CD25−) cells, at Treg-to-T responder ratios as low as 1:30 (Fig. 6⇓B). CNS CD4+CD25− cells in contrast enhanced proliferation 2- to 3-fold in these assays (data not shown). Interestingly, there was a hierarchical potency of suppression by CD4+CD25+ cells from different sources: EAE CNS ≫ EAE LN > naive LN (Fig. 6⇓B), fitting with the CD4+CD25+ cells in the CNS being highly activated, as suggested by their phenotype (Fig. 4⇑). 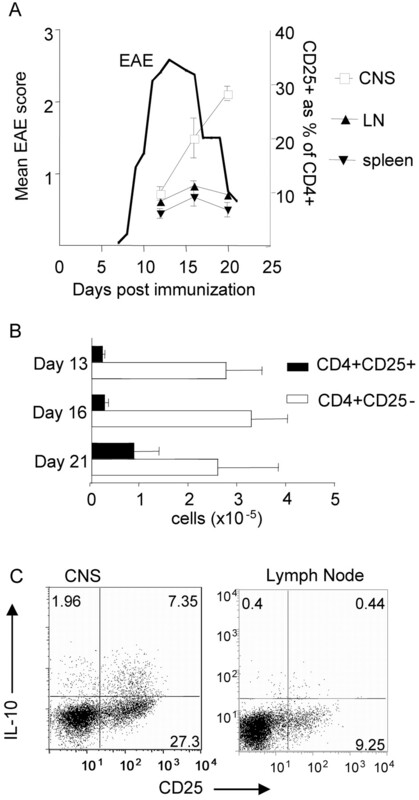 Furthermore, only the CNS-derived CD4+CD25+ cells were capable of significantly inhibiting the proliferation and cytokine production of CNS CD4+CD25− cells (Fig. 6⇓C and data not shown). CD4+CD25+ cells from the CNS of mice in remission are potent suppressors in vitro. A, CD4+CD25+ cells were sorted from the CNS and inguinal LN of mice 20 days post-EAE induction or from peripheral LN of naive mice. B, Representative purity of the sorted CNS populations is indicated. C, CD4+CD25− responder cells from naive syngeneic mice (2 × 104/well) were cultured with the indicated ratio of CD4+CD25+ cells. D, CNS CD4+CD25− cells were used as responders at a 2:1 ratio with CD4+CD25+ cells from the indicated sources. E, Naive responders were cultured at a 2:1 ratio with CD4+CD25+ cells in the presence of 10 μg/ml anti-IL-10, anti-IL-10R, or medium only as indicated. In all cases, cells were stimulated with anti-CD3. Percent inhibition of responder CD4+CD25− cell proliferation is shown. Data were consistent in three (C) or two (D and E) separate experiments. Because a high proportion of CNS CD4+CD25+ cells produced IL-10 ex vivo, their dependence on IL-10 for suppression of in vitro responses was assessed by adding blocking Abs to the cultures. Neither anti-IL-10 nor anti-IL-10R had any effect on the in vitro suppression by cells derived from the CNS or LN (Fig. 6⇑D). Accumulation of CD4+CD25+ cells in the CNS of mice in the recovery phase of EAE suggested that these cells may contribute to remission. Phenotypic analysis and in vitro assays confirmed the regulatory function of these cells but not their importance in vivo. We therefore examined the effect of CD25+ cell depletion on EAE. Administration of the anti-CD25 mAb, PC61, 3 days before induction of EAE resulted in over 90% depletion of peripheral CD25+ cells, followed by a gradual recovery to normal levels by 4 wk (Fig. 7⇓A). It has also been confirmed that FoxP3+CD25+ cells are depleted by this treatment (L. A. Stephens, unpublished observations). Mice treated in this way before EAE induction developed disease of increased severity compared with isotype-treated controls (Fig. 7⇓B). Importantly, the recovery phase of the CD25-depleted mice was markedly delayed (and often prevented in the time frame examined) compared with controls, confirming that CD4+CD25+ cells are required for the rapid recovery normally seen in this model. CD25+ cell depletion before EAE induction exacerbates severity and delays recovery, and postrecovery CD25+ cell depletion restores susceptibility to reinduction. A, Mice were given 1 mg of PC61 or isotype control Ab (rat IgG1), and the proportion of CD4+CD25+ cells in peripheral blood was monitored over time by FACS (two mice per group). B, Mice were given 1 mg of Ab 3 days before induction of EAE (five mice per group; data are from one of five consistent experiments). PC61-treated mice developed EAE of significantly increased severity compared with isotype controls (p < 0.001). C, Proportion of CD4+CD25+ cells in the CNS of mice 3 days after Ab administration on day 34 post-EAE induction. D, Mice were given PC61 or isotype control Ab on day 30 postimmunization and 3 days later were rechallenged with MOG-(35–55) in IFA and pertussis toxin (five or six mice per group; result shown is from one of two similar experiments). EAE scores after rechallenge were significantly increased by PC61 administration (p < 0.011). Induction of EAE in B6 mice using the MOG-(35–55) peptide in our hands results in a monophasic course of disease (10), and relapses are very seldom observed after remission. It has been reported that Lewis rats that have recovered from EAE induced with myelin basic protein develop lifelong resistance to further induction of EAE (24). Susceptibility of mice to reinduction of EAE is less well characterized. We found that mice that were reimmunized 6 wk after the initial immunization with MOG-(35–55) (i.e., after full recovery) showed a mild and short secondary disease compared with mice immunized for the first time (data not shown) To investigate whether CD4+CD25+ cells are required for this resistance to reinduction, CD25+ cells were depleted in vivo 30 days after primary EAE induction (after mice had recovered). This resulted in depletion of CD25+ cells in the CNS as well as lymphoid sites (Fig. 7⇑C and data not shown). Mice were then rechallenged 3 days later with MOG-(35–55) and pertussis toxin. As expected, mice that received the control Ab remained resistant to reinduction of EAE (Fig. 7⇑D). However, CD25-depleted mice developed EAE of similar severity to their own primary course of EAE (Fig. 7⇑C), although unlike naive mice treated with PC61, rechallenged mice did not show impaired recovery. Thus, CD4+CD25+ cells are involved in mediating the active resistance to reinduction seen soon after recovery from EAE in this model. Transfer of high numbers (2–3 million) of CD4+CD25+ cells purified from the peripheral LN of naive mice reduces the severity of EAE in recipients (25, 26), and we have corroborated this result (data not shown). Preactivation of Tregs in vitro increases their potency (27). Therefore, one would predict that CD4+CD25+ regulatory cells that have accumulated in the CNS during inflammation should be highly potent and able to reduce or prevent EAE severity in recipients at low cell frequencies. CD4+CD25+ cells from the CNS of recovering mice were FACS sorted and transferred into naive recipients either 1 day before or 1 day after immunization to induce EAE. In each case, transfer of as few as 2 × 104 CNS-derived CD4+CD25+ cells significantly reduced disease severity in recipients, whereas the same number of naive LN CD4+CD25+ cells had no effect (Fig. 8⇓). It is likely that this protective effect would have been enhanced had it been possible to use greater numbers of cells. Therefore, CD4+CD25+ cells from the CNS of mice in remission appear to be ∼100 times more potent than CD4+CD25+ cells from LN of naive mice. 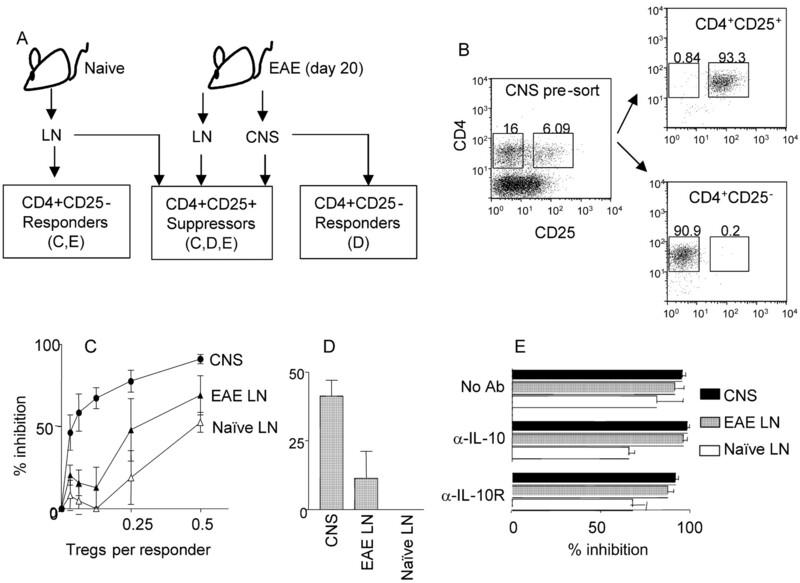 Transfer of low numbers of CNS CD4+CD25+ cells reduces EAE severity and accelerates recovery. CNS-derived (day 20 postimmunization) or naive LN CD4+CD25+ cells were transferred into naive recipients (2 × 104/mouse) and EAE induced. Results are pooled from two similar experiments, with a total of 10 or 11 mice per group. CNS CD4+CD25+ cells gave significant protection from EAE compared with PBS and naive controls (p < 0.019). This study investigated the natural mechanisms at play in the resolution of CNS autoimmune disease. We found that the accumulation of CD4+CD25+ FoxP3+ regulatory cells in the CNS correlated with the recovery phase of EAE. Moreover, depletion of CD25+ cells inhibited recovery, and transfer of small numbers of CNS CD4+CD25+ cells suppressed subsequent EAE in recipients. There is now a large and convincing literature on the important role of CD4+CD25+ Tregs in preventing spontaneous or induced autoimmune disease. Two reports have recently shown the reduction of EAE severity by transfer of high numbers of CD4+CD25+ cells from naive mice (25, 26). CD4+CD25+ cells can also prevent spontaneous EAE in transgenic mice bearing myelin basic protein-reactive TCRs (28). Although these studies clearly demonstrate the ability of Tregs to prevent EAE in mice, they do not address the role of Tregs in mediating natural remission once CNS inflammation is established. Our findings highlight that these cells make a significant contribution to controlling an ongoing inflammatory lesion at the effector site. We have yet to definitively characterize the mode of action by which the CD4+CD25+ cells can regulate EAE. However, CD4+CD25+ cells were the major source of IL-10 in the CNS (Fig. 2⇑), and IL-10 production is crucial for full recovery (6). It was also notable that IL-10 production was enriched in the CNS (effector site) compared with the LN of recovering mice (Fig. 3⇑B). Protection from EAE by transfer of naive CD4+CD25+ cells has been shown to require production of IL-10 by the transferred cells (26), suggesting that Treg-derived IL-10 is crucial for the function of these cells in EAE. The presence of IL-10-producing CD25+ cells in the CNS but not peripheral LN strongly suggests their role in mediating recovery from EAE in the site of inflammation. Although the in vitro suppression by these cells did not appear to be IL-10 dependent, this is consistent with the main body of evidence on these cells: that IL-10 is not the mechanism of in vitro suppression but may be important in vivo in some models (11). Also, the in vitro assays only test the suppression of T cells; in vivo other cell types such as macrophages may also be important targets of Tregs in the CNS. The markedly impaired recovery of mice depleted of CD25+ cells confirmed the importance of these cells for recovery. Two groups have reported enhanced severity of EAE after CD25 depletion (26, 29), and one found no effect (30), but none of these studies looked at effects of CD25+ cell depletion on the recovery phase. Depletion of CD25+ cells before induction of EAE may result in an increased expansion of pathogenic effector T cells; indeed, the severity of disease was increased in CD25-depleted mice. Despite this, the rate of recovery was markedly slower than would normally be expected. In vivo depletion of CD25+ cells after recovery, which overcame resistance to reinduction, is in some ways more informative, since any other regulatory mechanisms contributing to recovery and the active resistance to reinduction should remain unaffected by this treatment. It can therefore be said that CD4+CD25+ cells play an active and central role in mediating recovery from EAE, and this remains in effect in the time period immediately after recovery. Tregs that have recently been activated or expanded in vitro are more potent than resting Tregs (27, 31, 32); indeed, the CD4+CD25+ cells in the CNS appear phenotypically more highly activated in the CNS than in the LN. In accordance with this, these cells were more potently suppressive in vitro. Also, very low numbers of CD4+CD25+ cells from the CNS were able to transfer protection to naive recipients, whereas the same number of CD4+CD25+ cells from the LN of naive mice had no effect. This may explain the apparent discrepancy between the timing of the entry into the recovery phase and the enrichment of CD4+CD25+ cells in the CNS, which is most marked later in the recovery phase. A relatively small number of these highly potent cells may be sufficient to begin downregulating the inflammation, and the large proportion seen in later phases then simply reflects their continued recruitment/expansion in the CNS. Although Tregs were initially described as being hypoproliferative by in vitro studies, it is now clear that these cells can be expanded in vivo by encounter with Ag (14, 15, 16, 17, 33), particularly in the presence of inflammatory signals, such as up-regulated costimulatory molecules on LPS-matured dendritic cells (15). Immunization with Ag in adjuvant also induces localized expansion of transgenic CD4+CD25+ cells (14, 16), and even in steady-state conditions a proportion of Tregs appear to be continuously proliferating at low levels in vivo (17), presumably in response to self-Ag. In several models, CD4+CD25+ expansion has been found to be localized to the LN draining the target organ or site of immunization (13, 14), so expansion requires a relevant (auto) Ag. Prevention of diabetes in NOD mice also appears to require a relatively high frequency of CD4+CD25+ cells with specificity for pancreatic islet Ag (31, 32). We have yet to establish the Ag specificity of the CD4+CD25+ cells in the CNS, but we would predict that before recruitment to the CNS they are expanded in the draining LN in response to MOG-(35–55) and/or other CNS Ag presented by activated APC migrating from the immunization site or the inflamed CNS. Recently, transfer of CD4+CD25+ cells has been shown to cure established colitis (18, 34) and early onset diabetes (31), if administered in sufficient numbers or activation status. These studies suggest that in vitro expansion and reinoculation of the patient’s own Tregs may prove an effective therapy for autoimmune conditions, particularly in diseases with a relapsing-remitting course such as multiple sclerosis. It has recently been reported that CD4+CD25+ cells from multiple sclerosis patients have an intrinsically reduced regulatory activity (35). However, this study was not longitudinal and analyzed peripheral blood samples. Because our data point to the accumulation of the most potent Tregs being dependent on time (recovery) and site (the CNS), further studies in multiple sclerosis are clearly required. Although sampling human CNS is obviously prohibitive, the levels of CD4+CD25+ cells in the joints of patients with juvenile idiopathic arthritis have been reported to show some inverse correlation with disease progression (36), although the cells did not appear to be curative and a different group have reported enrichment of CD4+CD25bright cells in joints regardless of disease severity (37). Understanding the physiological mechanisms that drive the expansion and recruitment of Tregs in EAE will provide further insights for the development of effective therapies for autoimmune disease. Finally, we have recently described a role for B cells as a source of IL-10 in controlling the recovery phase of EAE, and this appears particularly important in limiting the persistence of a Th1 immune response against MOG in the lymphoid organs (10). Our current data suggest no role for B cells in the CNS but that Tregs are the dominant and essential regulatory population in the target organ. We therefore propose a two-cell model for the regulation of CNS autoimmune disease in these mice: B cells limit the continued expansion of fresh pathogenic cells from the lymph nodes, whereas Tregs control inflammation in the CNS either by direct effects on the pathogenic T cells or through modulation of cells of the innate immune response, as has recently been reported in models of intestinal inflammation (38). Determining whether and how Tregs and B cells interact in the recovery process will be our next step in understanding the complexities of immune regulation in CNS autoimmune disease. We thank Andrew Sanderson and Jan Vrana for cell sorting. ↵1 This work was supported by grants from the Medical Research Council and the Biotechnology and Biological Sciences Research Council, U.K. S.M.A. is a Medical Research Council Senior Research Fellow. ↵3 Abbreviations used in this paper: EAE, experimental autoimmune encephalomyelitis; LN, lymph node; MOG, myelin oligodendrocyte glycoprotein, Treg, regulatory T cell; PcP, peridinin chlorophyll-a protein. Mendel, I., N. Kerlero de Rosbo, A. Ben-Nun. 1995. A myelin oligodendrocyte glycoprotein peptide induces typical chronic experimental autoimmune encephalomyelitis in H-2b mice: fine specificity and T cell receptor V β expression of encephalitogenic T cells. Eur. J. Immunol. 25:1951.-1959. MacPhee, I. A., F. A. Antoni, D. W. Mason. 1989. Spontaneous recovery of rats from experimental allergic encephalomyelitis is dependent on regulation of the immune system by endogenous adrenal corticosteroids. J. Exp. Med. 169:431.-445. O’Brien, N. C., B. Charlton, W. B. Cowden, D. O. Willenborg. 1999. Nitric oxide plays a critical role in the recovery of Lewis rats from experimental autoimmune encephalomyelitis and the maintenance of resistance to reinduction. J. Immunol. 163:6841.-6847. Lenz, D. C., R. H. Swanborg. 1999. Suppressor cells in demyelinating disease: a new paradigm for the new millennium. J. Neuroimmunol. 100:53.-57. Moore, K. W., R. de Waal Malefyt, R. L. Coffman, A. O’Garra. 2001. Interleukin-10 and the interleukin-10 receptor. Annu. Rev. Immunol. 19:683.-765. Bettelli, E., M. P. Das, E. D. Howard, H. L. Weiner, R. A. Sobel, V. K. Kuchroo. 1998. IL-10 is critical in the regulation of autoimmune encephalomyelitis as demonstrated by studies of IL-10- and IL-4-deficient and transgenic mice. J. Immunol. 161:3299.-3306. Jander, S., J. Pohl, D. D’Urso, C. Gillen, G. Stoll. 1998. Time course and cellular localization of interleukin-10 mRNA and protein expression in autoimmune inflammation of the rat central nervous system. Am. J. Pathol. 152:975.-982. Cua, D. J., B. Hutchins, D. M. LaFace, S. A. Stohlman, R. L. Coffman. 2001. Central nervous system expression of IL-10 inhibits autoimmune encephalomyelitis. J. Immunol. 166:602.-608. Wolf, S. D., B. N. Dittel, F. Hardardottir, C. A. Janeway, Jr. 1996. Experimental autoimmune encephalomyelitis induction in genetically B cell-deficient mice. J. Exp. Med. 184:2271.-2278. Fillatreau, S., C. H. Sweenie, M. J. McGeachy, D. Gray, S. M. Anderton. 2002. B cells regulate autoimmunity by provision of IL-10. Nat. Immunol. 3:944.-950. Sakaguchi, S.. 2004. Naturally arising CD4+ regulatory t cells for immunologic self-tolerance and negative control of immune responses. Annu. Rev. Immunol. 22:531.-562. Shevach, E. M.. 2002. CD4+ CD25+ suppressor T cells: more questions than answers. Nat. Rev. Immunol. 2:389.-400. Green, E. A., Y. Choi, R. A. Flavell. 2002. Pancreatic lymph node-derived CD4+CD25+ Treg cells: highly potent regulators of diabetes that require TRANCE-RANK signals. Immunity 16:183.-191. Walker, L. S., A. Chodos, M. Eggena, H. Dooms, A. K. Abbas. 2003. Antigen-dependent proliferation of CD4+ CD25+ regulatory T cells in vivo. J. Exp. Med. 198:249.-258. Yamazaki, S., T. Iyoda, K. Tarbell, K. Olson, K. Velinzon, K. Inaba, R. M. Steinman. 2003. Direct expansion of functional CD25+ CD4+ regulatory T cells by antigen-processing dendritic cells. J. Exp. Med. 198:235.-247. Klein, L., K. Khazaie, H. von Boehmer. 2003. In vivo dynamics of antigen-specific regulatory T cells not predicted from behavior in vitro. Proc. Natl. Acad. Sci. USA 100:8886.-8891. Fisson, S., G. Darrasse-Jeze, E. Litvinova, F. Septier, D. Klatzmann, R. Liblau, B. L. Salomon. 2003. Continuous activation of autoreactive CD4+ CD25+ regulatory T cells in the steady state. J. Exp. Med. 198:737.-746. Mottet, C., H. H. Uhlig, F. Powrie. 2003. Cutting edge: cure of colitis by CD4+CD25+ regulatory T cells. J. Immunol. 170:3939.-3943. Huehn, J., K. Siegmund, J. C. Lehmann, C. Siewert, U. Haubold, M. Feuerer, G. F. Debes, J. Lauber, O. Frey, G. K. Przybylski, et al 2004. Developmental stage, phenotype, and migration distinguish naive- and effector/memory-like CD4+ regulatory T cells. J. Exp. Med. 199:303.-313. Lehmann, J., J. Huehn, M. de la Rosa, F. Maszyna, U. Kretschmer, V. Krenn, M. Brunner, A. Scheffold, A. Hamann. 2002. Expression of the integrin αEβ7 identifies unique subsets of CD25+ as well as CD25-regulatory T cells. Proc. Natl. Acad. Sci. USA 99:13031.-13036. Fontenot, J. D., M. A. Gavin, A. Y. Rudensky. 2003. 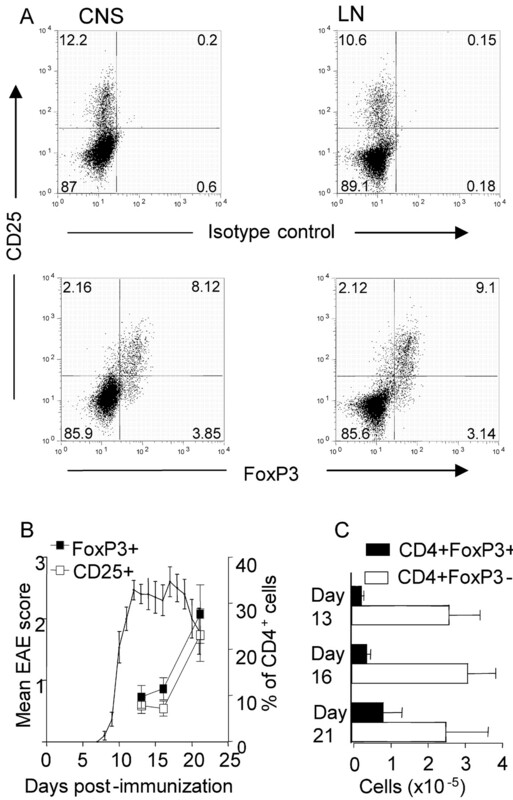 Foxp3 programs the development and function of CD4+CD25+ regulatory T cells. Nat. Immunol. 4:330.-336. Hori, S., T. Nomura, S. Sakaguchi. 2003. Control of regulatory T cell development by the transcription factor Foxp3. Science 299:1057.-1061. Khattri, R., T. Cox, S. A. Yasayko, F. Ramsdell. 2003. An essential role for Scurfin in CD4+CD25+ T regulatory cells. Nat. Immunol. 4:337.-342. Hinrichs, D. J., C. M. Roberts, F. J. Waxman. 1981. Regulation of paralytic experimental allergic encephalomyelitis in rats: susceptibility to active and passive disease reinduction. J. Immunol. 126:1857.-1862. Kohm, A. P., P. A. Carpentier, H. A. Anger, S. D. Miller. 2002. 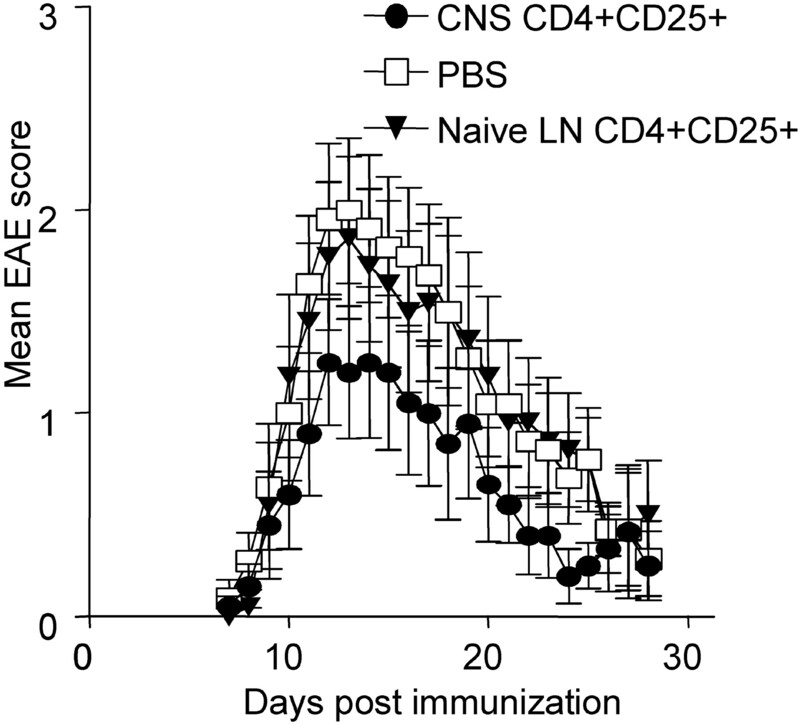 Cutting edge: CD4+CD25+ regulatory T cells suppress antigen-specific autoreactive immune responses and central nervous system inflammation during active experimental autoimmune encephalomyelitis. J. Immunol. 169:4712.-4716. Zhang, X., D. N. Koldzic, L. Izikson, J. Reddy, R. F. Nazareno, S. Sakaguchi, V. K. Kuchroo, H. L. Weiner. 2004. IL-10 is involved in the suppression of experimental autoimmune encephalomyelitis by CD25+CD4+ regulatory T cells. Int. Immunol. 16:249.-256. Thornton, A. M., E. M. Shevach. 2000. Suppressor effector function of CD4+CD25+ immunoregulatory T cells is antigen nonspecific. J. Immunol. 164:183.-190. Furtado, G. C., D. Olivares-Villagomez, M. A. Curotto de Lafaille, A. K. Wensky, J. A. Latkowski, J. J. Lafaille. 2001. Regulatory T cells in spontaneous autoimmune encephalomyelitis. Immunol. Rev. 182:122.-134. Montero, E., G. Nussbaum, J. F. Kaye, R. Perez, A. Lage, A. Ben-Nun, I. R. Cohen. 2004. Regulation of experimental autoimmune encephalomyelitis by CD4+, CD25+ and CD8+ T cells: analysis using depleting antibodies. J. Autoimmun. 23:1.-7. Kohm, A. P., J. S. Williams, S. D. Miller. 2004. Cutting edge: ligation of the glucocorticoid-induced TNF receptor enhances autoreactive CD4+ T cell activation and experimental autoimmune encephalomyelitis. J. Immunol. 172:4686.-4690. Tang, Q., K. J. Henriksen, M. Bi, E. B. Finger, G. Szot, J. Ye, E. L. Masteller, H. McDevitt, M. Bonyhadi, J. A. Bluestone. 2004. In vitro-expanded antigen-specific regulatory T cells suppress autoimmune diabetes. J. Exp. Med. 199:1455.-1465. Tarbell, K. V., S. Yamazaki, K. Olson, P. Toy, R. M. Steinman. 2004. CD25+ CD4+ T cells, expanded with dendritic cells presenting a single autoantigenic peptide, suppress autoimmune diabetes. J. Exp. Med. 199:1467.-1477. Gavin, M. A., S. R. Clarke, E. Negrou, A. Gallegos, A. Rudensky. 2002. Homeostasis and anergy of CD4+CD25+ suppressor T cells in vivo. Nat. Immunol. 3:33.-41. Liu, H., B. Hu, D. Xu, F. Y. Liew. 2003. CD4+CD25+ regulatory T cells cure murine colitis: the role of IL-10, TGF-β, and CTLA4. J. Immunol. 171:5012.-5017. Viglietta, V., C. Baecher-Allan, H. L. Weiner, D. A. Hafler. 2004. Loss of functional suppression by CD4+CD25+ regulatory T cells in patients with multiple sclerosis. J. Exp. Med. 199:971.-979.
de Kleer, I. M., L. R. Wedderburn, L. S. Taams, A. Patel, H. Varsani, M. Klein, W. de Jager, G. Pugayung, F. Giannoni, G. Rijkers, et al 2004. CD4+CD25bright regulatory T cells actively regulate inflammation in the joints of patients with the remitting form of juvenile idiopathic arthritis. J. Immunol. 172:6435.-6443. Cao, D., R. Vollenhoven Rv, L. Klareskog, C. Trollmo, V. Malmstrom. 2004. CD25brightCD4+ regulatory T cells are enriched in inflamed joints of patients with chronic rheumatic disease. Arthritis Res. Ther. 6:R335.-R346. Maloy, K. J., L. Salaun, R. Cahill, G. Dougan, N. J. Saunders, F. Powrie. 2003. CD4+CD25+ T(R) cells suppress innate immune pathology through cytokine-dependent mechanisms. J. Exp. Med. 197:111.-119.